When a person dies, we sometimes use the colloquialism that they “passed away.” It’s a polite and delicate way of addressing a sensitive sorrowful part of life. We don’t usually want loved ones to pass away. Separation from loved ones is a part of life we don’t enjoy. Ask most parents and they will agree the departure of their children from home is a difficult passing away. As we age, we reminisce about how life and our personal history has passed away. But there are some things we want to pass away. There are some things in life that we can’t wait to just pass away. For some, they can’t wait for school years to pass away. For others there are relationships they wish would pass away. For those caught in sin, there are times of life complications, even periods of incarceration they wish would hurry up and pass away. There are normal parts of life we all want to pass away. Mortgages, school and car loans, financial debts are all things we wish would pass away yesterday. Yes, there are things in life we wish would never pass away, and there are things in life we wish would quickly pass away. In the second to last chapter of the Bible it speaks of what we have to look forward to in the hereafter. There will be a time when this world and even the heavens will “pass away.” There’s a wonderfully hopeful and liberating message to glean from the opening words of this glorious chapter. Let’s look at them. This verse introduces the transition God will make in His Creation from an old earth and old heaven to a new earth and new heaven. God is going to do an entirely new thing. The word “new” (Greek kainos) means fresh, something new in age, newly made, unused, unworn. But for something new to come, the old must be done away with. Jesus taught we can’t put new wine into old wineskins (Matthew 9:17). That principle applies here too. For instance, it states, “Also there was no more sea.” Of the 346 times “sea” is mentioned in scripture, this is the final occurrence. I live on an island. Many people here make their living connected with the sea. Many people here enjoy the beach and ocean. Tourists and vacationers come to this part of the world to enjoy the sea shore and sea. Why no more sea? 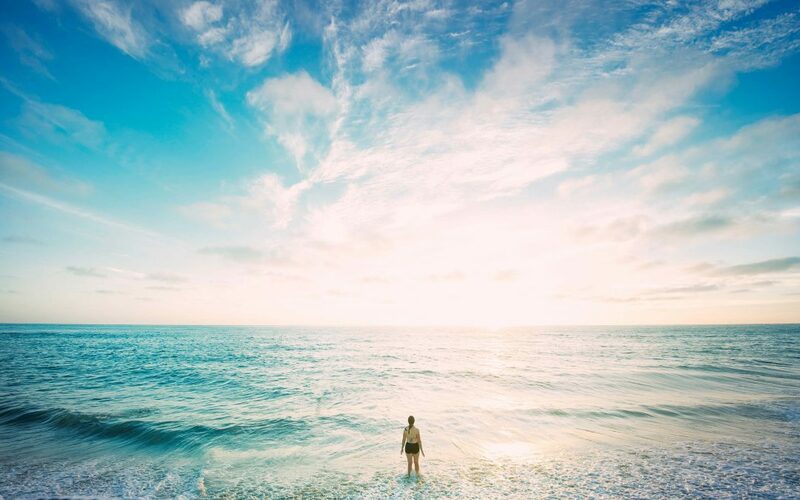 While the sea can be a source of nourishment, refreshment, cleansing, and recreation it can also be connected less favorable things. While God specifically provided the rainbow as a reminder that He would never again judge the world by a flood, the sea itself and the formations of continents are residual effects of the Flood. The sea and waters of the world serve as a reminder of the Flood of judgment God brought in earlier days (Genesis 6-9). In heaven there will be no more Judgment. Maybe that’s why there won’t be any sea. The sea can be a place of discipline as the life of Jonah testifies (Jonah). The sea can be a means of God’s defeat of His enemies as Pharaoh and his armies learned (Exodus 13-14). There are storms at sea. We feel most helpless on stormy seas (e.g. Acts 27-28). Even the skilled and experienced disciples were fearful on stormy seas (Matthew 8). It took Jesus to settle them in the storm. Jesus calms the stormy seas. In heaven, there will be no more frightening storms. With our glorified bodies and sinless natures there will be no need for discipline, defeating enemies or stormy seas. Maybe that’s why there will be no more sea. The ocean is the last great frontier of earth. In the western Pacific Ocean at the south end of the Mariana Trench by the Island of Guam there is what is called the Challenger Deep. This is the deepest part of the ocean measured at approximately 36,200 feet deep. That’s just under seven miles deep! The ocean is dark and mysterious. The ocean can be intimidating and scary. The ocean is a place where human beings cannot breathe or survive without life support systems. I propose that there is no more sea in heaven because there are no more deep dark dangerous scary intimidating and potentially suffocating parts of heaven. There is no more sea because all of its connections with the fallen world are gone. There is no more sea for all the right reasons. And whatever good parts there are connected with the sea, you can be sure God will have a most blessed replacement. John explains to us here that, “the first heaven and the first earth had passed away.” God is going to do something complete new, fresh, wonderful. He is going to make a new heaven and a new earth. He inspires John to use the phrase “passed away” to communicate what He is going to do. What does that mean “passed away”? There’s another passage of New Testament scripture that provides us with helpful additional information to answer this question. At a point in God’s plan He is going to “pass away,” the material universe as we know it. Let’s examine this further. In this passage of 2 Peter we see in verses 5-6 that the first world was destroyed by water. The world as it then existed perished and was changed completely in terms of how it had been known. This world is going to “pass away.” It’s going to be a momentous event. It’s going to be powerful and universally existence altering. And God is going to do it. “Pass away” is a translation of a single Greek term, parerchomai. This is a compound term. The prefix para means by. The root word erchomai means to come, to go. Therefore, the idea here is to pass, to pass by, or to pass away. This is a word with a broad application. It can be used as it is in Revelation 21:1 to describe a universal effect. It can also be used in daily life to describe someone passing by as they walk. The idea of transience associated with this term can be seen when blind Bartimaeus was told that Jesus was passing by. (Luke 18:37) The word is used in scripture to speak of the passing of time on an ocean voyage (Acts 27:9). It is also used to refer to portions of our life that have passed by (1 Peter 4:3). When things such moments in time, or situations, or circumstances pass by, you can’t get them back. Those precious moments of life pass by never to be fully recaptured. We can take a photo or even a video, but we can never fully recapture that moment, the moments that pass by and pass away. Here is an encouragingly wonderful thought. Just think of that. Not only are we a “new” (Greek kainos) fresh creation in Christ, but our old life of past sins and scars is “passed away” into oblivion. When we receive Jesus as Savior and Lord, when we trust Him as Savior, God transforms us mightily. At the point of faith in Christ, the old is put away and everything becomes new. When a person turns from their sins to Jesus and receives Him and forgiveness for their sins by faith, there is a mighty transformation that takes place. When we trust Jesus as Savior, our sinful past passes away just as thoroughly as the old earth and old heaven are going to be pass away in the end. That should be a source of great comfort for you. It should also be instructional. Don’t let the enemy or your flesh or mind bring up old sins that have been done away with through faith in Jesus Christ. Think on the things that are true (Philippians 4:8-9). And the truest of true things is the fact that the blood of Jesus cleanses us from all sin (1 Peter 1:18-19; 1 John 1:7 and 9). We are redeemed from our debt of sin by the blood of Jesus (Ephesians 1:7). This is a magnificent gift of God’s grace in Jesus. The enemy will keep trying to dig up your past. But its been buried with Jesus! And you have been raised with Jesus to “newness” (Greek kainotes) of life (Romans 6:4). The Devil is an undertaker. We in Christ are overcomers. Don’t let the undertaker keep you under. Overcome in Christ! Should Jesus not return soon, we will die. Our bodies will pass away. At the point of death comes judgment (Hebrews 9:27). For those who die in their sin without having put faith in Christ as Savior, that is a very bad thing. But as James states here, we, the “brother” or sisters in Christ, can “glory in . . . exaltation.” We have an incredibly hopeful existence to look forward to. Eternal life begins for us now. For those who now accept Jesus as Savior, there is the hope of a glorious eternal life that will never pass away! There’s a word that occurs even more than the word “sea.” The word “forever” occurs 383 times! The book of Revelation uses this word thirteen times. In the final chapter it states, “There shall be no night there: They need no lamp nor light of the sun, for the Lord God gives them light. And they shall reign forever and ever” (Revelation 22:5). Those are wonderful words! No night. Only day. Forever and ever. Wonderful! God is in the “forever” business. “The LORD is King forever and ever” (Psalm 10:16). His throne is “forever” (Psalm 45:6). His name endures “forever” (Psalm 72:17; 135:13). He endures “forever” (Psalm 102:12). God’s righteousness endures “forever” (Psalm 112:3). The truth of the LORD endures “forever” (Psalm 117:2). His word is “forever” settled in heaven (Psalm 119:89). His glory endures “forever” (Psalm 104:31; Romans 11:36). God’s “kingdom and power and glory” are “forever. Amen” (Matthew 6:13). There are many ways the word “forever” is used. It is used as hyperbole or an expression of emphasis such as “I will give thanks to You forever” (Psalm 30:12). And there are other more literal ways “forever” is used, such as “The counsel of the LORD stands forever” (Psalm 33:11). The inheritance of the upright will be “forever” (Psalm 37:18). God’s covenant with Israel is “forever” (Psalm 89:4; 105:8). Some mistakenly presume their part in such inheritance (Psalm 49:11-12). Thankfully God’s mercy endures “forever” (Psalm 106:1; 118:1ff. ; 136). The mercy of God is forever bound up in Jesus. God is glorified “forever” in Jesus (Romans 16:27’ Ephesians 3:21). Jesus will “forever” be glorified for His atoning work on the cross and resurrection from the dead. The Apostle Paul was inspired to say it like this, “This is a faithful saying and worthy of all acceptance, that Christ Jesus came into the world to save sinners, of whom I am chief. However, for this reason I obtained mercy, that in me first Jesus Christ might show all longsuffering, as a pattern to those who are going to believe on Him for everlasting life. Now to the King eternal, immortal, invisible, to God who alone is wise, be honor and glory forever and ever. Amen” (1 Timothy 1:15-17). And for those who trust Jesus as Savior, the indwelling Holy Spirit is promised “forever” (John 14:16). These are wonderful truths of great blessings, and they will continue forever! In these two portions of Scripture Jesus is praying to the Father that if it be possible the task of going to the cross be removed from Him. There are some things we want to pass us by. The cross and all it entailed was something even the Son of Man wished would pass Him by. On the cross the sins of the world, the sins of all humanity for all time, would be borne by Jesus. And yet, the Bible tells us, “looking unto Jesus, the author and finisher of our faith, who for the joy that was set before Him endured the cross, despising the shame, and has sat down at the right hand of the throne of God” (Hebrews 12:2). Jesus took the cross joyfully, because He knew it was the only way to have us spend eternity with Him. That’s how much He loves us. You can depend on God making a way for your old life to pass away. Jesus said, “Heaven and earth will pass away, but My words will by no means pass away.” (Matthew 24:35; See also Mark 13:30-31 and Luke 16:17; 21:32-33). The words of Jesus will not pass away. You can depend on God’s word. It isn’t going anywhere. It is settled in heaven. When you go to heaven you will be able to reference the word of God and still be edified by it. God’s word will eternally be His revelation language. There are things we want to pass away. There are things we want to never pass away. If you come to Jesus and ask Him to forgive your sins because you trust Him as Savior and believe He died on the cross to pay your sin penalty, He will forgive you and give you life that will last forever. That can happen right now. It’s just a prayer away. Sometimes we crave on earth what we can only experience in heaven. A parent grieves the departure of children from home. We want loved ones to be with us forever. Sometimes we even want certain parts of life to go on forever. But this world is not our home. This world is a gigantic step down from what awaits us in glory. This world is a slum compared to heaven. And only in heaven will we never have to experience the sorrow of separation from loved ones. In the New Heaven and New Earth, we will never experience aging or decay of anything. In the New Heaven, we will forever be with Jesus and He with us. There is nothing better than the New Heaven and New Earth because it will never end. The New Heaven and New Earth will never pass away. But understand, if you die in your sins, if you die without trusting Jesus as Savior, you will face a just judgment. Die in your sins, without Jesus as Savior, and you will be forever separated from God and all good and all grace. If you die in your sins without trusting Jesus as Savior, you will go to hell and you will ultimately be cast into the Lake of Fire. So horrid is sin and those who choose sin that they will forever suffer in burning and torment and it will be completely appropriate and just. This is forever devastation. And this is forever part of God’s truth. I would be bankrupt if I didn’t include this part of God’s truth. And remember, indecision is decision. You are either for or against Jesus (Matthew 12:30). There is no middle ground. Father in heaven I come humbly before you in Jesus’ name. I admit I am a sinner. I have sinned against you. I am guilty. I deserve only condemnation. I don’t ask Your forgiveness based on anything I have done. I ask Your forgiveness based on what Jesus has done for me. I believe Jesus has paid my debt of sin on the cross. And I believe His death on the cross is completely sufficient for You to justly forgiven all of my sins. I believe Jesus rose from the dead to show that You accepted His atoning sacrifice on the cross as the sufficient basis for forgiveness of sins. I receive Jesus as my Savior by faith. I ask that the Holy Spirit indwell me and give me eternal life and to help me live with Jesus as my Lord forever. Father in heaven, please pass away all my old sins and old life and give me new life in Jesus. I receive this by faith. I believe I am a new creation in Jesus. Thank You Lord. Thank You for loving me so much. I hope you prayed that prayer. I hope you prayed it from your heart in faith. If you have, if you know Jesus, the only “sea” in the hereafter you will need to concern yourself with, is the sea of God’s love that will fill you and overflow you for eternity. That’s a “sea” that will forever continue in eternity. Get ready to take it all in. The sea of God’s love will never pass away. Enjoy!